Posted by Benjamin Dell on Nov. 29, 2013 . We've been busy working on making Updatey even more useful and, of course, beautiful. The volume of feedback we've received since the beta started has been just incredible. It seems there really is a need out there for a product that helps project managers, business owners and team leaders keep their key clients and stakeholders up to date in an engaging and effective way. Updatey is great, but if it can't communicate with the external services my team are already using, then it's just another tool i need to remember to keep up-to-date. Sometimes our clients and stakeholders (investors etc) are just too busy to check into Updatey every day / week. There needs to be a way for Updatey to send them weekly updates. These are two really interesting insights. When we first dreamt up Updatey we thought it could (and possibly should) exist as a lean and intentionally simple tool for people to visualise the progress of their projects on a single timeline. The reality of course, is that a tool like that is never going to be fully adopted unless it is able to satisfy a wider range of needs (such as external integrations) - in short, it must continue to evolve. So, with our thinking caps firmly on, we set about focusing on the above insights. We hope you like what we've come up with. 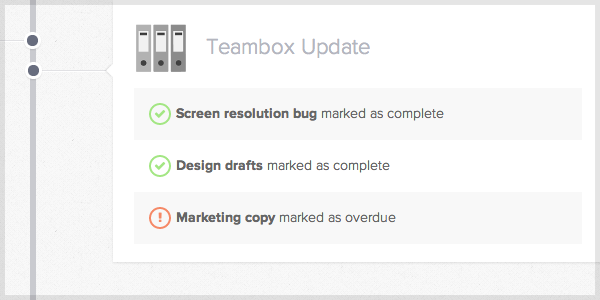 We're working hard on adding external integrations to Updatey, so that your team can be kept up-to-date on the important achievements (or set-backs, but we know there are never any of those!). Updatey seamlessly communicates with these external services and updates your project's activity feed with what's been happening. Perfect for keeping everyone on the same page, but without the 'noise'. We're already setup with Teambox, Basecamp and Pivotal Tracker - with more integrations coming soon! We have users updating their timeline and adding posts to their feed multiple times a day; which is great! but perhaps the real power behind Updatey lies in what it can help you do whilst you're busy actually working on your project. Our soon to be released weekly Highlight Reports are a great example of this. 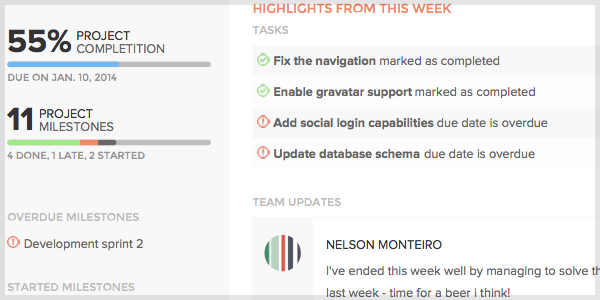 Each week Updatey will email each of your team members asking them to reply directly to the email with a short snippet describing something that has happened over the last week on the project (it might an achievement, a failure, a risk or a humorous anecdote). Once all of the team updates have been received your highlight Report is generated and sent out to the rest of the team. Finally, a report your clients, investors and wider team will look forward to receiving - and you didn't even have to lift a hand to write it! These are just two features being released at the moment, there's much more on its way! We'd love to know what you think, so do get in touch!